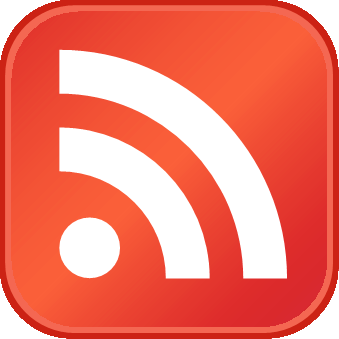 Millennials Overtake BoomersAccording to Pew Research Millennials will overtake Baby Boomers this year. This year, the “Millennial” generation is projected to surpass the outsized Baby Boom generation as the nation’s largest living generation, according to the population projections released by the U.S. Census Bureau last month. Millennials (whom we define as between ages 18 to 34 in 2015) are projected to number 75.3 million, surpassing the projected 74.9 million Boomers (ages 51 to 69). 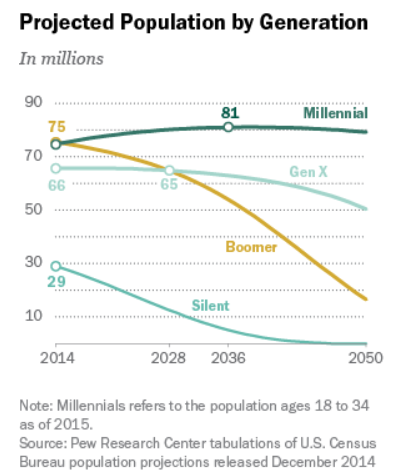 The Gen X population (ages 35 to 50 in 2015) is projected to outnumber the Boomers by 2028. 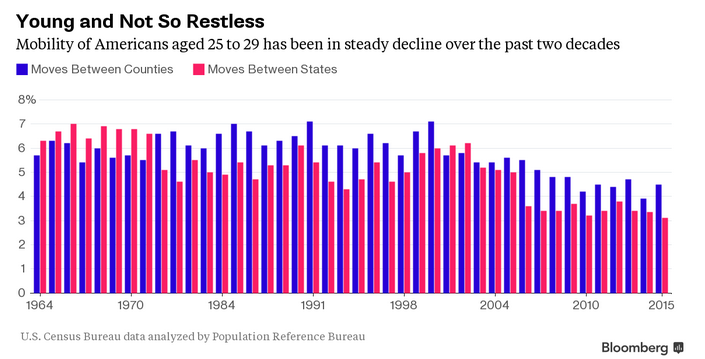 Why are So Many Millennials Still in the Basement? 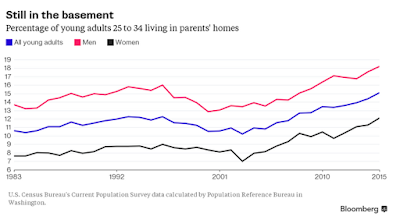 Bloomberg has some interesting charts and commentary in its report Here's Evidence That Millennials Are Still Living With Their Parents. In 2015, 15.1 percent of 25 to 34 year olds were living with their parents, a fourth straight annual increase, according to an analysis of new Census Bureau data by the Population Reference Bureau in Washington. The proportion is the highest since at least 1960, according to demographer Mark Mather, associate vice president with PRB. The tough job market for young people since the recession ended in June 2009 is also contributing to a lower mobility rate. Adults under 30 are typically the most mobile part of an American workforce, constantly on the move since the 19th century. That mobility has been seen as a key advantage of the flexible U.S. labor market compared with places like Europe. The latest Census data show just 3.1 percent of Americans from 25 to 29 relocated in the last year between states, just half the share of 2002. While moves between counties in the same state — less likely to be for jobs — have increased some, they too remain below pre-recession levels, according to PRB's analysis. Goldman Sachs economists, who examined the phenomenon of "kids living in the basement" in an August report, found a few reasons to explain it. Millennials, the 82 million people born between 1981 and about 2000, have been plagued by chronic underemployment since the recession — consider the college grad working as coffee barista — and rising student debt is proving to be a lasting burden. "Above-average youth underemployment rates alone account for about one-third of the increase in the share of young people living with their parents, and lagged effects of the recession probably account for a bit more," Goldman's David Mericle and Karen Reichgott wrote. Goldman Sachs just touched on the reasons. I think we can do much better. Let's expand the list. Problem number 1, student debt is well understood. But note that the trend towards living at home started rising sharply in 2000, well before the 2007 recession and well before the current student debt crisis. 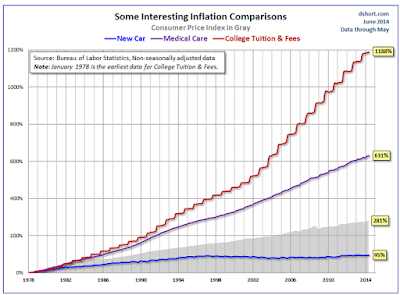 We must go well beyond student debt to explain the trend. 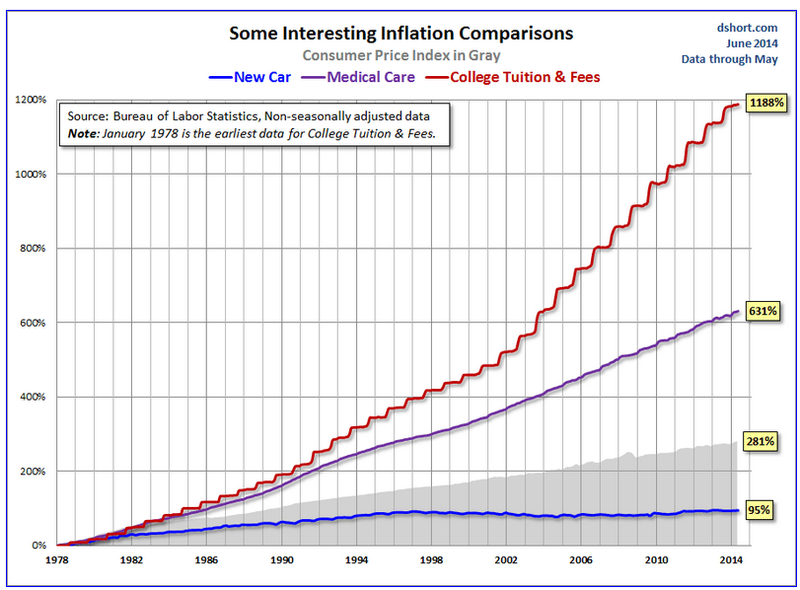 The trend towards living at home took a sharp jump higher just as tuition costs, went through the roof. Chart from Doug Short's Thoughts on Student Debt. What else happened in the 2000-2002 time frame? The answer is home prices went through the roof. 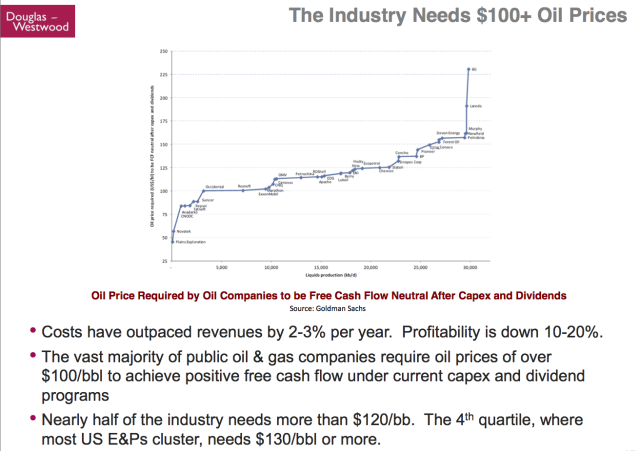 The above from Doug Short at Advisor Perspectives. 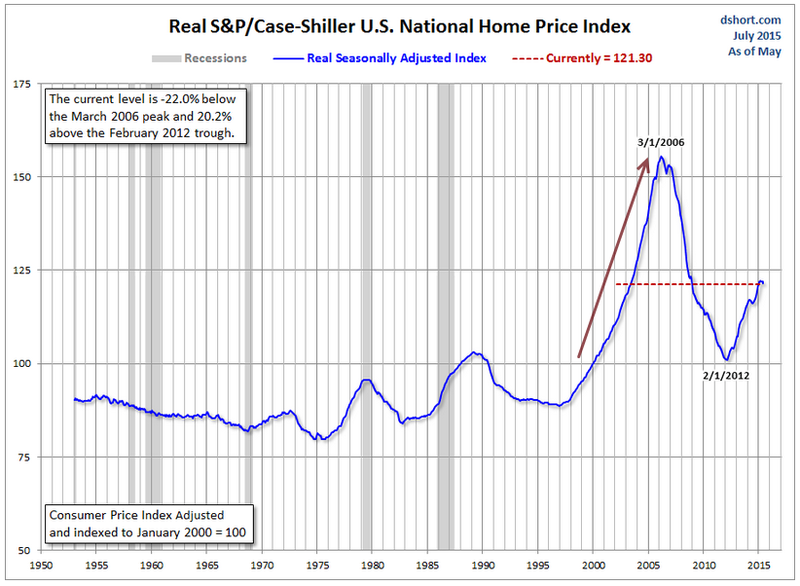 The above chart from my article Housing Prices, "Real" Interest Rates, and the "Real" CPI. 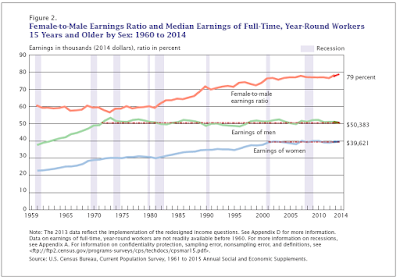 Now let's look at real earnings, not just jobs. By the way, those "real earnings" numbers assume you believe the government's measure of inflation. Note that the CPI does not reflect home prices or property taxes, and is at best a crude, inefficient, measure of prices. Those aged 18-24 typically do not buy houses and more millennials than ever before are in school. 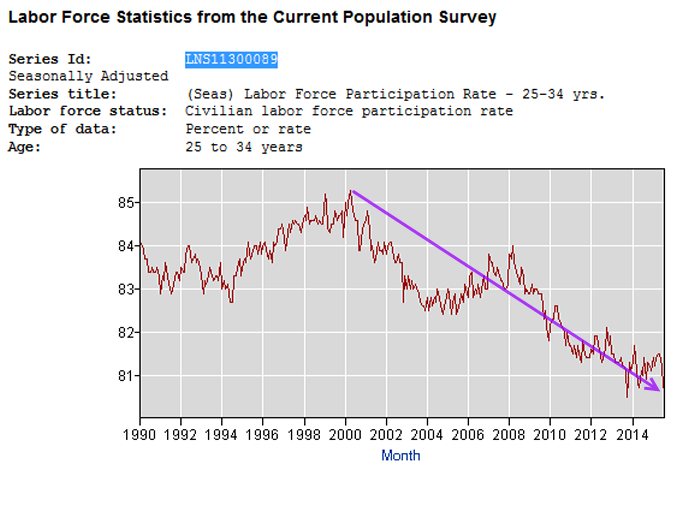 But let's remove school from the equation by looking at the participation rate of those aged 25-34. 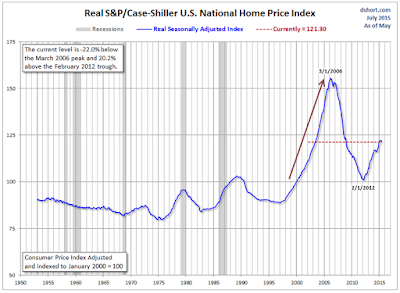 Once again we see bad news starting in or around 2000, just as home prices soared. Until this year, "boomers" were the largest group demographically speaking. Boomers are aging. Many are in poor health, cannot take care of themselves, and cannot afford or do not want to be placed in a nursing home. 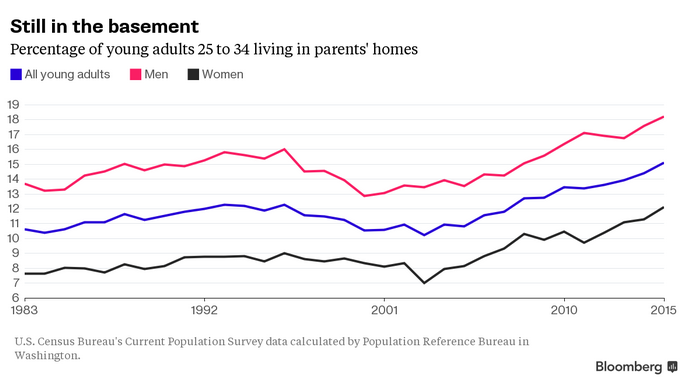 This need forces many millennials to move in with their parents, simply to take care of them. Goldman's David Mericle and Karen Reichgot see a "silver lining" based on the idea children will one day leave their parents' basements, and that household formation will prove to be a huge boost to a subpar housing recovery. I take the opposite view based on changing attitudes, real earnings, and a certain inevitability. The inevitability is death. As boomers die off many will simply choose to stay where they are living. This especially holds true where homes are not fully paid off. 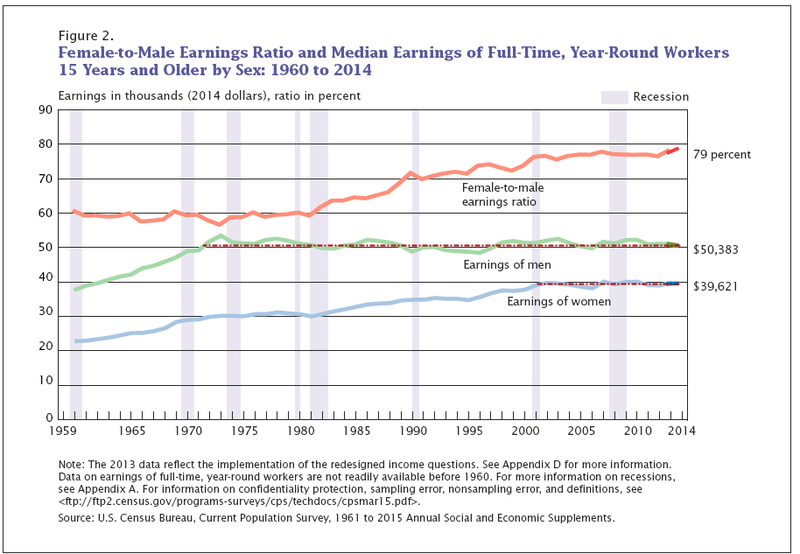 And there is no reason to believe the trend in real earnings is about to change. So how are the "young and not-so restless" supposed to suddenly get restless unless real earnings take a sharp rise higher? Finally, neither Bloomberg nor Goldman discussed points seven and eight regarding attitudes. 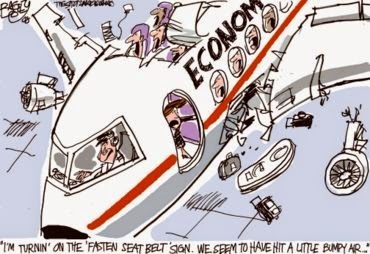 The Fed has been perplexed as to why its policies have not worked.The explanation is pretty easy. 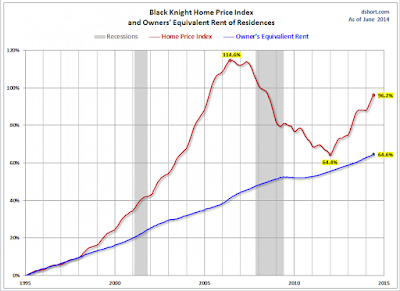 I have been writing about it ever since the housing bust. Kids see their parents and grandparents arguing over debt and ability to pay bills. Many lost their houses to foreclosure. Divorce, suicides, and clinical depressions over the loss of jobs or homes are widespread. And the once widely-held notion that one's home is a retirement nest-egg has been smashed on the hard rocks of reality. Millennials (at least those hit hard in the crisis) don't want to be like their parents, chasing the suburban dream, ill-equipped to take on debt when they have poor-paying jobs and a mountain of student debt on top of it. Attitudes are like pendulums in that they move from one extreme to the other before reversing. Unlike pendulums, attitudes take a very long time to go from one end to the other. It took multiple generations for people to fully forget the great depression. Many who were wiped out in the stock market crash of 1929 never got back in. In contrast, boomers had no recollection of the crash. Instead they have recollection of the Fed bailing them out time, after time, after time. Those 18-34 have no recollection of being bailed out of anything. They see the problems that debt caused their parents, and a significant number do not want any part of chasing the boomer's dreams. Eventually the boomers will die and the number of millennials living with their parents will start to reverse. Just don't expect an economic boom from it any time soon. Attitudes towards debt have changed. 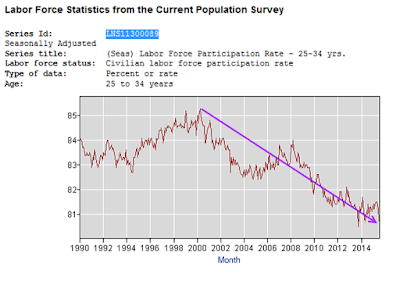 There is no economic nor demographic reason that suggests the attitude pendulum is close to a reversal.